Together with the second and concluding half of our exclusive interview with director Adrian Maben, which features many questions set by none other than Storm Thorgerson! A four part analysis by Paul Powell Jr, with help and suggestions from Adrian Maben. After thirty years of walking through the sands of time, our curious journey has taken us here to this magical moment. The Director's Cut of Pink Floyd Live at Pompeii is a defining moment in this long cinematic journey. For old and new Floyd fans alike, the classic film we've grown so familiar with has now been enhanced with wonderful new images carefully blended in to give Live at Pompeii a whole new perspective. For this, our fourth and final article in the Revisiting Live at Pompeii series, I'm going to carefully explore the contents of the new DVD version of this enigmatic film and dispatch back what I've discovered. Along the way, we'll examine the often prickly technical process of updating old celluloid films into the new crisp digital world, have a few laughs with the Floyd, and finally, wrap up our exclusive interview with Director Adrian Maben. The Director's Cut of a film allows the director of a completed commercial film to go back and re-incorporate footage left on the cutting room floor (or computer disc) during the final editing process, and/or to add supplement footage or effects, to comprise a newly updated vision of the film. The purpose of the Director of any film, is the responsibility for everything that occurs on location before the camera including the action and dialogue, and in the case of Live at Pompeii - the Floyd's musical performance. With today's computer technology and software, advanced editing machines, and other digital manipulation of film, the possibilities are seemingly limitless what can be achieved within the field of cinematography. However, it comes down to the Directors artistic vision to make the creative leap of faith to realize a new version of an old established film. Like a master chef, the less is more approach often satisfies the senses better than overwhelming them with too much information. As the Director of a wide range of very fine documentary films, Adrian Maben has enriched and re-imagined Live at Pompeii with new ingredients, updating without upsetting the balance of the original Pompeii film, resulting in a much more entertaining movie experience. Happily, the Director's Cut of Live at Pompeii strikes a fine balance between the familiar celluloid version of the film released thirty years ago and the new crisp digital version released now on DVD. From the outset, the new version of Live at Pompeii incorporates dramatic footage of rocket launches to up-close images of Saturn and her many moons, onwards past our own moon's richly textured surface, racing past it towards the bright blue earth. Our interplanetary journey culminates with the aerial shot of Pink Floyd performing in the ancient amphitheater of Pompeii, interspersed with transitory images of the International Space Station and a cloud-enshrouded Mount Vesuvius. The various space footage featured throughout the new DVD is sourced from NASA, the BBC, the Jet Propulsion Laboratory, European Space Agency, among others. At first, I had some reservations about the purpose and relevance of the space footage and simulated computer imagery used throughout the Director's Cut. However, in subsequent viewings the celestial imagery served as a fine counterpoint to the terrestrial footage of Pompeii and the glacial pace of the Floyd's early 70's music. For example, it does not take a stretch of the imagination to see how the Abbey Road studio version of "Brain Damage" can merge perfectly into NASA film footage of the 1969 Apollo Moon landing. As before, the film presents "Echoes" in all of its grandiosity, now framed in beautiful widescreen format with crystal clear digital picture quality. It is quite a remarkable achievement to update an old film to bring it up to current quality standards. On this new Pompeii DVD, the re-mastering process has retained the warmth and resolution of celluloid, yet updated it with greatly cleaner sound resolution and enhanced picture quality. You will notice right away this new version of Live at Pompeii simply looks wonderful, clearly devoid of the many respective audio distortions and celluloid dropouts inherent in older films. Post-production of the new Pompeii DVD was done on the film industry standard Avid Editing System using the images that were originally shot in Pompeii on 35mm. The negative of the original film was then transferred directly onto digibeta beta tape and fed into the Avid. The original stereo sound was also enhanced and denoised, revealing a clarity and depth only hinted at in the original film. I think the overall results here are outstanding; while complicated and expensive, the digital restoration and enhancement techniques done by Monteurs Studio in Paris, used to restore and clean up the original film, presents the classic old Floyd film in a revealing new light. Throughout the Director's Cut of Live at Pompeii, finely crafted segments of computer animation are tastefully used as to circumvent a myriad of special effects from overwhelming the film. To illustrate the before and after of Pompeii's volcanic destruction, subtle animation effects are employed, such as casting light and shadow on the marble floor and columns from illuminating rays of sunlight. This quiet moment before the storm contrasts sharply, both thematically and visually, with the violent pyroclastic flow of molten lava rolling through Pompeii's city streets. The objective of the computer animation created by Capware Digital Video in Naples was to recreate Pompeii and other Italian archaeological sites in order to make them appear to be as they existed when they were first built. Another special effect, as discussed below in reference to the Roman statue morphing into David's face, was a technique created by a French special effects company in Paris called Teletota, while some specific computer animations of the planets was done exclusively in-house by the BBC for Director Maben. Among the new Floyd material in this film are a generous amount of black and white footage shot in France, such as David and Rick laying down vocal overdubbing tracks for "Echoes." My favorite singular moment in the film occurs early on in the film during "Echoes Pt. 1," when a special effect technique allows a profile shot of a Roman statue face to morph smoothly into David's. This transitory film clip effectively suggests a merging of the past with the present, and imagines a correlation of mythological Roman gods with the Rock stars of today. Throughout "Echoes," various shots of these marble sculptures are tastefully interspersed, giving the film a classic timeless feel. Originally excavated from the ancient ruins of Pompeii or Heraculaneum, these beautiful statues now can be found in the Museo Nazionali de Napoli. Across the history of modern civilization, it has been whispered Roman gods and Rock stars alike are imperfect, as candidly illustrated in "Echoes Pt. 1" when David and Rick jovially screw up their vocal tracks. Further on during "Echoes Pt. 2" we see more black and white Paris footage of David and Rick singing in harmony and acappella. The purpose of the "Echoes" studio sessions were to lay down vocal tracks in order to double up the quality of the vocal sound in synch with the original Pompeii recording. While all of the vocal tracks in the Pompeii concert film are entirely live, this overdubbing techniques gives the vocals a more meaty presence, a standard recording studio and post-production film technique. The new cinematography throughout the Director's Cut of Live at Pompeii is at once breathtaking and highly imaginative. For example, time lapse aerial views of the beautiful Bay of Naples seaport harbor contrast sharply with the restless fury of volcanic terrain, violently spewing red-hot rivers of liquid rock into the steaming sea. In addition to the old color interview footage, a generous selection of new black and white interview footage is tightly integrated into the new film. As noted in article one in this Pompeii series, the physical absence of Rick is corrected here in the new DVD with several minutes of candid interview. Throughout the new black and white interviews, brave attempts by Director turned interviewer Adrian Maben to elicit straight answers from David and Roger proves both elusive and humorous, irreverent and spontaneous. Picture the Floyd enjoying a scrumptious feast on fresh oysters, and then imagine during this event being interviewed on camera - at one point Adrian Maben asks: "Do oysters put you in a good mood for working?" Nick quickly responds: "Adrian, look this has got to stop! This attempt to elicit conversation out of the chaps is doomed to failure, they know you're trying to get them to talk!" A great sense of humor is a quality most people don't expect from the Floyd. This long-standing assumption is completely shattered when the oyster eating scene in question nearly turns into a full-blown Monty Python comedy routine. As David and Roger continue slurping down the hapless slimy creatures in a carnivorous eating frenzy, a spontaneous dialogue erupts among David, Rick and Roger. David, countering a quizzical inquiry from Maben if the oysters in question were French in origin proclaims: "Well, I don't know what nationality they are!" Roger sharply follows up with: "I'd like to think that oysters transcend national barriers Adrian!" In fact, Director Adrain Maben reveals that during the recording sessions at Abbey Road for Dark Side of the Moon, the Floyd would often wrap up recording sessions in order to gather round the television for the daily episode of Monty Python's Flying Circus on the BBC. And not to fear - Nick's apple pie eating conundrum in the EMI Abbey Road canteen remains intact and completely unresolved. During my recent discussions with Director Adrian Maben, some new Pompeii film revelations have come to light - for instance, I was nearly certain all along that the songs shown in the film (minus the Abbey Road studio sessions) were filmed entirely in Pompeii. Not so it turns out, the Pompeii pieces that were filmed in Paris (haunting night scenery you will recall), were "Careful with that Axe Eugene," "Set the Controls for the Heart of the Sun," and "Mademoiselle Nobs." Also, with the exceptionally rare and brief exception, the fact is, there are no lengthy interviews with the group on camera during the 70's. Thus, the interview footage contained within Live at Pompeii becomes even more poignant; an important milestone in the Floyd's career. For the recent "Interstellar" exhibition at Paris's Cite de la Musique, the audiovisual research workers of the Cite looked tirelessly for on-camera interviews with the Floyd, and the only ones that they could find are in Pink Floyd Live At Pompeii! So where are we now? Pink Floyd Live at Pompeii in all of its juxtaposition of ancient images and modern technology, music and chat, grandiosity and simplicity, transcends the documentary or concert performance format to solidify its position as one of the most successful and influential music films in cinema history. Don't get me wrong, there is ample room for further enhancement in a future DVD deluxe edition, if that is the case, such as engineering that DVD with 5.1 Surround Sound and supplying a nice book with plenty of unreleased photos and thoughtful essays. Still, the Director's Cut DVD features a generous selection of goodies to satisfy most Floyd fans - the original concert film is presented without the interview footage shown in "normal" television format, plus we get an insightful 24 minute interview with Director Adrian Maben, a short history of Pompeii with maps, a photo gallery, song lyrics, illustrations of press reviews and cinema posters, and more. The onscreen DVD menus are very easy to navigate and nicely laid out to get you up to viewing speed in no time. The DVD label is dark red featuring a distant shot of Mount Vesuvius smoking. The insert is basic yet has dramatically better graphics and pictures mirroring the disc label and case design. All this is wrapped up in a classy orange, green and blue plastic case with illustrations designed by Pink Floyd graphic arts guru Storm Thorgerson. The new Live at Pompeii DVD has certainly been a long time coming for all Floyd fans. It now proudly joins the ranks with other truly great Rock music films also making the leap to DVD format - The Band's The Last Waltz (Dir. Martin Scorsese), Talking Heads' Stop Making Sense (Dir. Jonathan Demme), The Beatles' Hard Days Night (Dir. Richard Lester), and The Who's The Kids Are Alright (Dir. Jeff Stein). Presently as we travel along on our intrepid journey through a media-drenched pop culture, I will say without any reservation, this new Pompeii DVD is an essential and thrilling addition to any Pink Floyd collection, and an important document for popular music historians everywhere. Director Adrian Maben has done a sterling job with his Director's Cut DVD of Live at Pompeii. Ideally, the highest compliment you can pay to any creative work of art is the compulsion to enjoy it again and again. The new Pink Floyd Live at Pompeii DVD does this and much more, with its imaginative blend of vivid cinematography and excellent musicality, it simply takes your breath away! ...Suddenly the small screen of the DVD player is saturated by a profusion of crisp images and resonant sounds, as brand new Pompeii material converges with classic footage. Destruction and creation play out on a grand scale as the film progresses. Concurrently, the last rays of the setting sun cast elongated shadows across the vast desert expanse, revealing subtle ripples of variegated coral sand. Darkness falls quickly to the delight of the many nocturnal creatures scurrying about. Deep into the cool desert night, illuminated only by a trio of flickering campfires, the new Pompeii DVD spins on and on. From this experience, a collective joy permeates the desert camp. Above, the night sky is brilliantly illuminated by a vast panorama of twinkling stars. Camels slumber quietly. Time disappears. Stillness. Fade to black. For the remainder of Revisiting Live at Pompeii article four, we are concluding our extensive interview with Director Adrian Maben, of which many of the questions were set by Storm Thorgerson! Q: Why were the Floyd so distrustful of the Press? Adrian Maben: In the seventies, there were no Pink Floyd interviews with the press and very few appearances of the band on television. Roger Waters once told me that when they were touring the States they hired a person specifically to reply NO to any requests for interviews or talk shows. They didn't need the press. Indeed the press and television were suspicious - part of an adult world that was to be ignored or despised. Of course, the more they refused an interview the more the press tried to get to them... This was the Pol Pot quality of the Floyd: remain unseen, enigmatic, don’t let anyone know who we are. Our private lives and family are nobody else’s business. This "keep out of the media glare" idea extended to publicity for their concerts. As far as I can remember there were very few posters or advertisements in the press for their shows - word of mouth was sufficient. Even prior to the Dark Side of the Moon album, a venue like the Earls Court auditorium could be filled almost overnight if rumor spread that the Pink Floyd were going to do a concert there. One of the consequences of this distrust of the press was that each individual member of the band could walk down the street without being recognized. I think that this non recognition was something that appealed to them - provided of course that their public concerts could always draw a large crowd. "Are you happy with the filming?" "What do you mean, happy?" "Well do you think it's interesting?" After a long pause, "What do you mean, interesting?" Roger Waters was perhaps the most unsettling of the four during an interview. Peter Watts, the roadie, mentioned to me that Syd Barrett was a hundred times worse. Q: Any notes on the post production? Adrian Maben: Did they see a working print of the film? Yes, everything seemed to go down well except for the transflex shots which they, especially Roger, did not like. The editing was done in the country and because of lack of funds to rent a suitable space the interciné editing table was in an atelier next to my bedroom. In retrospect, I think that it's a disastrous idea to have the cutting room in a house where you live. There should be a distance between the place where you edit a film and the place where you eat and sleep. The 1972 Edinburgh Film Festival was a breakthrough. 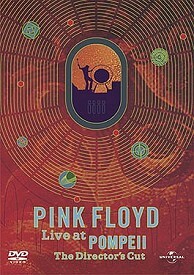 The reviews were surprisingly good and Pink Floyd Live at Pompeii, in its first version lasting one hour, was launched. But why be content with a film on Pink Floyd that only lasts sixty minutes? Fly fishing with Roger Waters a year later on the river Teme in Herefordshire we vaguely discussed the idea of doing an extended version. The band, he told me, was about to embark on a new recording in the EMI Abbey Road studios. Roger somehow managed to persuade the other members of the group and after a few months of telephone calls, hesitations and cancellations I was invited, with an English film crew, to film certain parts of the recording of... Dark Side of the Moon. In 1974 the second version of the film lasting eighty minutes was released complete with Dark Side footage, EMI canteen chit chat (mostly Nick Mason going on about eating a round piece of apple pie without the crust and Roger expanding on the subject of what makes a good record producer) and a few straight interviews of each member of the band. I tried hard to find a better title. Pink Floyd Live at Pompeii seemed to me too flat, too descriptive. I was searching for something more down to earth, more crunchy. In the end the old title stuck because of the major role of the city of Pompeii and because it’s something of a pleasant contradiction to play live in a place that is dead. Q: What are the best things you remember? Adrian Maben: The October light of Pompeii, the slow zooms at the beginning and end of Echoes, the creative editing of Jose Pinheiro (he later went on to direct his own films), the black and white footage of the oyster eating and the overdubbing sessions in Paris, the trivial dialogue about apple pie in the EMI canteen, the tension before and after the recording of each piece of music, the stress of getting the shoot to succeed in Pompeii. As far as I know, Pink Floyd Live at Pompeii is the only film that shows how the group actually work together in a recording studio. For example, the overdubbing of Echoes in Paris, or the making of Dark Side of the Moon in London. But form, as opposed to content, is equally important. I think that the rapid pace of the film, set against the stately zooms and tracking shots, is still effective today. You have to remember that the original version was completed in 1972 - light years away from MTV and today's musical videos. Pink Floyd Live at Pompeii, the first musical video? Q: What were the worst things you remember? Adrian Maben: The transflex operator who used two sets of ear plugs and kept on saying, "Why do they have to play so loud?" The incineration of the original 35mm material: 548 cans of rushes and negative (see later). The New Yorker critic who hated the film and wrote: "it was like the size of an ant crawling around the great treasures of Pompeii," or words to that effect. Q: Did the Floyd get on well with each other? Adrian Maben: There was never the slightest hint of an argument or a problem that could not be instantly solved. On the contrary, ideas sparked off each member of the group and were immediately accepted or put down with brutal frankness. I also remember, with deep appreciation, their great sense of humour and moments of laughter that never seemed to end. At times it was almost like being caught up in the vortex of some kind of Monty Python sketch. During the interviews we talked about how they managed to avoid in-fighting. "We have devised various methods" was Nick Mason’s rather vague reply. And David Gilmour added, "If you can’t get over that kind of problem, then you go the same way as all the other groups, don’t you?" Perhaps Roger Waters summed it up best, "We don’t face up to our difficulties in an adult way, if that's what you mean..."
Q: Was the original film a success? The producers kept coming back asking me to do another film. They said, "How about the Moody Blues with the Grand Canyon in the background or Deep Purple in front of the Taj Mahal?" It didn't make sense. It was time to move on and do something else. Q: Why did you use space footage for The Director’s Cut? Adrian Maben: Since the original version of this film was released space probes like Soho and Voyager have lifted off from earth to investigate the structure and atmosphere of the Sun, the planets and the moons of our solar system. Furthermore, Hubble, the space telescope, has taken unbelievably beautiful photos of the galaxies in outer space. Surely it is not too far-fetched to imagine that people or "creatures", living on a distant planet, pick up some echoes or signals of music that rebound off the stone walls of an ancient amphitheater? Today we are saturated with space imagery and to find shots that are both meaningful and visually impressive is, surprisingly, not as easy as one might think. After several conversations with David Gilmour I heard about the Planets series shot by the BBC and he suggested that I use some of their footage. As a result, and after the usual negotiations, many of the opening and closing shots of The Director’s Cut were selected and adapted from these television programs. The majority of the special effects are computer generated but contain an original NASA photo or film which serves as a starting point for their calculations. As for the rest of the space footage, my friend Patrick Hesters asked permission to use some shots that were found in the NASA video library. The research workers of the NASA seemed happy to collaborate with us and to see their frames combined with Pink Floyd music. Q: What’s the new black and white footage? Adrian Maben: Several years ago, when we discussed the possibility of making The Director's Cut for a DVD (Universal Pictures originally wanted an extended VHS but they changed their mind later!) the important question was asked about using the rushes and footage that had been discarded. While searching in the French and English film laboratories for the unused negative we learnt of a disaster. On the initiative of the French Production Company, MHF Productions, the 548 cans of 35mm negative and prints of the rushes had been stored at the Archives du Film du Bois d’Arcy outside Paris. One of the employees, a certain Monsieur Schmidt, "le Conservateur," unfortunately decided that he wanted to make extra storage space on his shelves for more recent films and that the Floyd footage was without interest or value. The 548 cans of negative and the prints of the Pink Floyd unused rushes and outtakes were incinerated. INCINERATED! Depressing, to say the least. And above all how could I make a Director’s Cut with outtakes that no longer existed? Fortunately I remembered that I had stored at home, in a big cardboard box, a few cans of black and white 16mm film that had been shot during the audio mix of the film in 1972. There was some interesting overdubbing of Echoes with David Gilmour and Richard Wright and some hilarious, tongue in cheek, out of focus interviews of the band chatting away and making fun of everybody - including themselves. After having synchronized and reviewed this vintage footage, the 16mm film was transferred onto digital beta tape, edited and inserted at suitable points into Pink Floyd Live At Pompeii. Q: What about the technical quality of the Director’s Cut? Adrian Maben: The DVD of The Director’s Cut was made directly from the 35mm negative of the intermediate version of Pink Floyd Live At Pompeii released in 1975. This means that the visual quality is definitely better than that of the VHS cassettes which were made from 35mm prints. The stereo sound of The Director’s Cut has been improved and "denoised." The original sound tapes still exist (they were not incinerated) so perhaps, one day, a 5.1 surround sound mix of Pink Floyd Live at Pompeii should be made and distributed with additional photos and a booklet. A sort of collector's DVD? For the record, The Director’s Cut took, on and off, about ten years to complete and would never have been finished without the sensible advice and considerable patience of Roger Water’s manager, Mark Fenwick. I was and still am most grateful to him. The new film now lasts 92 minutes and contains not only original never-seen-before footage but has also been given a complete face lift. Each frame has been cleaned, restored and transformed into the 16/9 aspect ratio. For the purists who are not interested in listening to the Floyd chit chat, the original concert film has also been restored and included in the DVD with its initial 4/3 aspect ratio. The art work of the DVD cover, the inside documentation and the DVD menus were created by Storm Thorgerson, the graphic artist responsible for the sleeves of most of Pink Floyd's records. Q: Do you still have any regrets today about the film? I still regret today the transflex shots of the seventies - but it was great to have eliminated nearly all of them in The Director’s Cut. I resent not having been allowed by Universal to complete the low flying helicopter tracking shots over Pompeii (it rained the day they were planned) because I had thought of them as being essential for The Director’s Cut. I should at least have asked the members of the band to participate in The Director’s Cut. But no doubt they would have refused. Perhaps it's better that way? Adrian Maben: Pink Floyd: Live At Pompeii: a visual scrapbook of music and trivial conversation. A record of the passing of time. A film that will never be finished with bits and pieces added here and there over a period of many years. Thanks To: My Parents for being so patient and supportive. Margaret and Jeff for their suggestions and proofreading. Adrian Maben for being engaged in all areas of this long Pompeii project. Matt for giving me the encouragement and opportunity to publish my work. Claire at Universal Studios in London for procuring an advance DVD for me. To Debra with heartfelt thanks for always inspiring me to ever higher levels of creativity. Acknowledgments: Two people were essential for the creation of Pink Floyd Live at Pompeii: Reiner Moritz, the original executive producer of the film in 1971, and Mark Fenwick, the executive producer of the Director's Cut. Without them the two versions of the film would never have been completed. Special Note: I would also like to extend get well wishes to Storm for a speedy recovery from those of us on this side of the Atlantic. Best Wishes old chap!